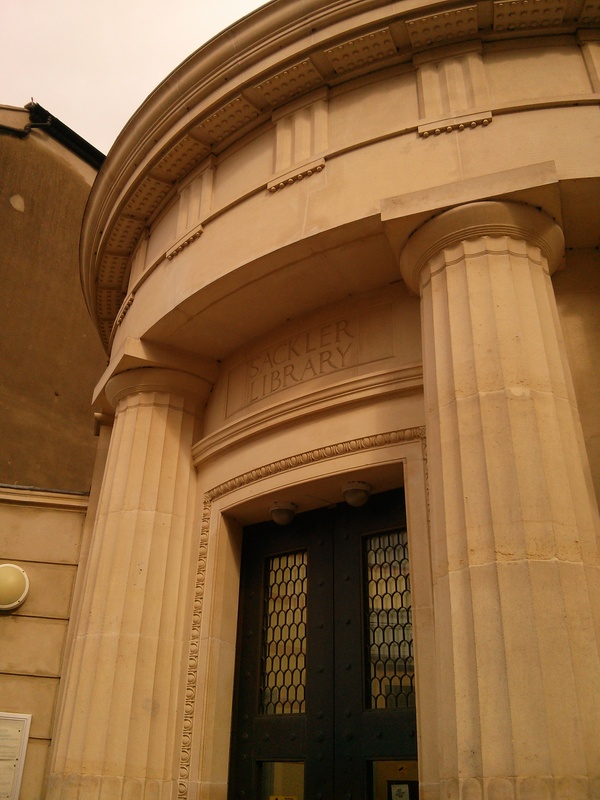 The Oxford Libraries Trainee Blog Has Moved! This blog will no longer be updated. Please bookmark the new address so you can follow the trainees. 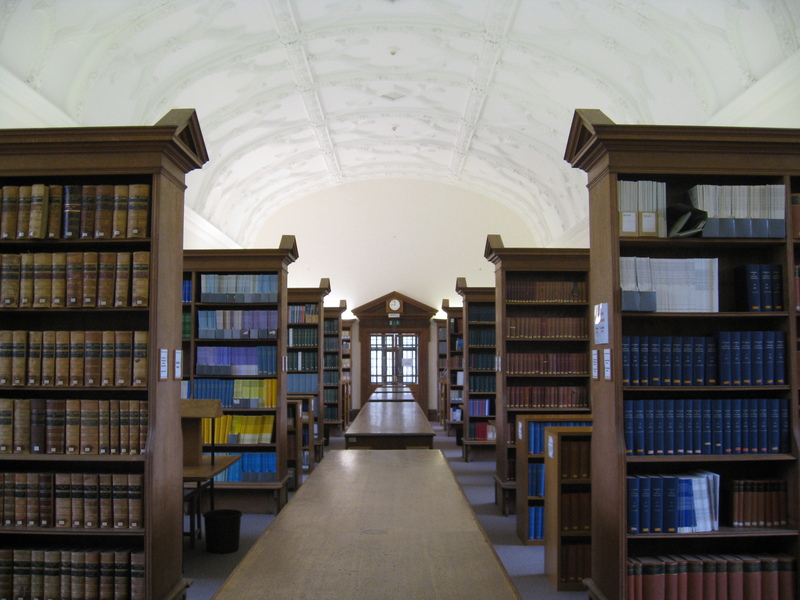 My year as a Graduate Trainee at the Bodleian Social Science Library: Trainee Projects! Being a trainee at the Bodleian Social Science Library has been a really interesting and rewarding experience. I’ve learnt a lot and have been involved with some really enjoyable projects, two of which I would like to talk to you about now. Like most people before they start a new job I wanted to find out as much as possible about the place I would be spending the next year before I actually started. Luckily the SSL has a very good website with lots of information on it, but as a semi-frequent ‘tweeter’ I noticed the lack of SSL presence on the social media website, Twitter. In a sense, though, this was a good thing, as it meant that when I started my trainee year I knew exactly what my first project would be! After agreeing that I would go ahead and create a Twitter account for the Library with the Reader Services Librarian, I consulted with one of my colleagues, the Senior Library Assistant (Research Support), who had already been thinking about how Twitter might be set up for the SSL. She directed me towards several books on the subject and suggested a few useful people to follow. Thankfully I was quite used to how Twitter works and it didn’t take me too long before I was ready to get started. After looking at lots of different Twitter profiles and how other libraries had set themselves up on the website, we decided to go for a simple approach and chose SSL colours (grey and purple) for the profile’s background. The profile has since been updated to the new style which does not show the colours quite as they were originally, but the famous SSL purple can still be seen here and there! After some research and deliberation I took the advice I found in some of the books I had read about Twitter; I created a macrocosm of 10 tweets that would act as a good example of what the SSL’s Twitter feed would be like. These 10 tweets were comprised of factual information and slightly more light-hearted and interesting things to prevent the feed from becoming too boring. These more light-hearted posts would always be related to the Social Sciences, Libraries, or Higher Education, to keep it relevant to our readers. It was only after this had been done that we started to think about who we would follow and how we would interact with others. We decided that, as one of the Bodleian Libraries, it would be appropriate to follow the other libraries who were on Twitter. We also decided to follow the University Colleges and departments that seemed relevant to us, and then a few external Tweeters like the LSE Impact Blog (@LSEImpactBlog) and the British Library (@britishlibrary). This all helps to keep us up to date with things that might affect us, and also provides us with new material to retweet for our followers. Recently it has also been my job to write a comprehensive set of instructions in a Staff Manual entry for using Twitter at the SSL. As it turns out, writing instructions can be quite a length process. It has been very useful though, as by going through everything in detail I have been able to spot some ways that current processes can be improved, leading to a more effective service for our readers. In addition to dealing with the Library’s social media output, trainees at the Social Science Library are responsible for assessing and repairing damaged books under the guidance of the Acquisitions Senior Library Assistant. 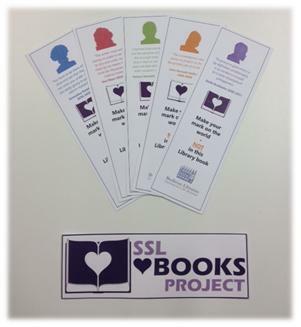 As part of trying to improve the general care of our collection we decided to launch the ‘SSL ❤ Your Books Project’ (also known as the ‘SSL Love Your Books Project’). This project hoped to tackle collection care at the level of readers, by encouraging them to take steps to look after the books that they borrowed from us. While many of us worked on different aspects of the project, I was responsible for creating a small selection of bookmarks that would be handed out to readers during the week that we promoted the project. After taking various factors into consideration (like what we would like the bookmarks to look like, what message we were trying to get across, and whether we could afford to print them using a commercial maker) we decided to use a simple and colourful design on sturdy white paper-card. We decided to advertise the project on one side of each bookmark, and on the reverse each would advertise a different part of the Technical Services team at the SSL. In addition to this I was also responsible for writing and publishing the Blog post that would go live on the SSL’s blog, and drafting the information that would go on the SSL’s website (even where the information would be displayed and how a user might navigate towards it!). Though this took some time, I hope you’ll agree that they explain everything you might want to know about the project. These pages can all be found at http://blogs.bodleian.ox.ac.uk/ssl/2014/03/03/ssl-love-books-project/, http://www.bodleian.ox.ac.uk/ssl/services/caring-for-the-collection and http://www.bodleian.ox.ac.uk/ssl/services/caring-for-the-collection/ssl-love-books-project. I feel like I’ve done rather a lot during my trainee year, and I very much hope that next year’s trainees all get to experience as much as I have. This will be the last post from me as I leave next week to take up a permanent role at one of the Colleges… Wish me luck! A belated and festive hello from the Bodleian Law Library! I’m Maddy, one of two trainees here at the Law Bod. (My partner in crime – or rather in fighting it, considering our working environment – is Ben, who I am sure will also introduce himself soon.) I graduated from the University of Warwick in 2010 with a first class degree in History of Art, followed that with a Postgraduate Diploma in the same subject at Edinburgh University, and then went on to spend two years working in a variety of cultural institutions including the Scottish National Gallery of Modern Art in Edinburgh and Oxford’s own Ashmolean Museum of Art & Archaeology. With the world of galleries and museums being an extremely competitive field, around this time last year I started to consider whether there might be any other careers I could be interested in pursuing and began a daily ritual of scouring online job listings for inspiration. For quite a while there was nothing that grabbed my attention, but then one afternoon in December – just as I was beginning to resign myself to the idea that working in a museum was the only thing I could ever see myself doing and that my life was therefore destined to become one long string of unpaid internships – I came across the advertisement for the Bodleian Libraries Graduate Traineeship Scheme. Remembering how much I had enjoyed the processes of studying and learning during my time at university, and combining that with my love of the printed word, I decided that it was an opportunity that would definitely be worth exploring. Now, three and a half months into the traineeship, I might not be able to give you the exact definition of jurisprudence but I definitely feel much more confident in my understanding of legal and library terminology. Our colleagues here at the Law Bod have been so helpful and encouraging, and I’m pretty sure I now know where most things are! While Ben is based in the Academic Services department and deals mainly with readers, I work in Technical Services and spend more time with the books. Alongside regular desk duties, I have settled into my routine of receiving the Law Library’s share of the Bodleian’s legal deposit items, processing them (which involves using the mysterious tattle-tape), sending them for cataloguing, labelling them, and passing them all on to Ben for shelving. (I’m sure he’ll tell you himself how much he loves it when I come and clutter up his shelves…) I help Lindsay, our Acquisitions Librarian, with recording orders and invoices, and I’m also responsible for the weekly display of new journals as well as a termly ‘Oxford Authors’ display. More recently, I have taken on the task of creating a list of a collection of constitutions held by the library and coming up with a new shelving arrangement in order to make them more accessible for readers. In the new year, I will also be starting to help with the ‘Bodleian Law Library Institutional Memory Project’ – an initiative aimed at celebrating the library’s 50th anniversary. All in all, I’m thoroughly enjoying library life and am very much looking forward to learning more about it throughout the rest of the year. For now, however, I wish you all a very merry Christmas and a great start to 2014! 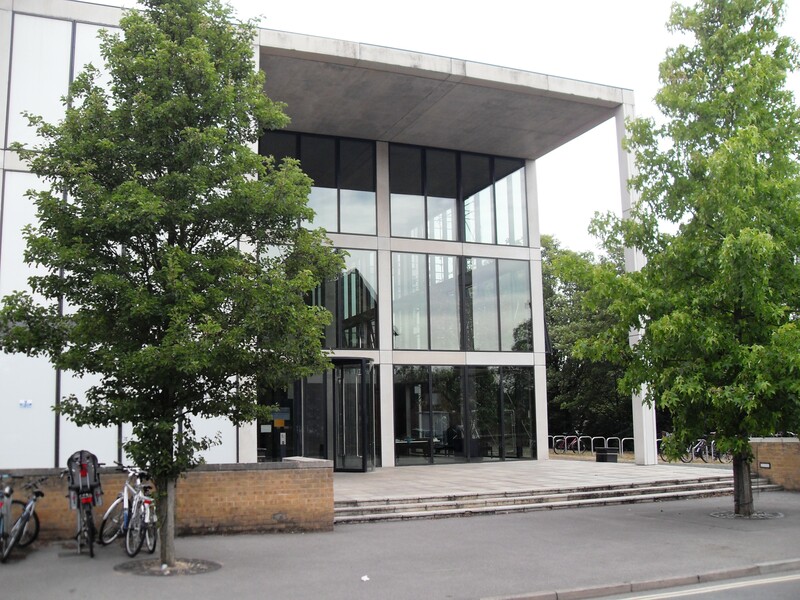 Hi, I’m Niamh, the trainee at Nuffield College Library. 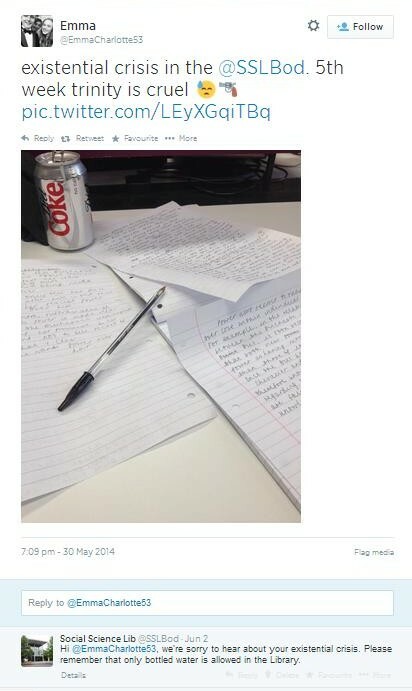 I studied for an M.A. in Philosophy and Theatre at the University of Glasgow, and then an M.Litt in Philosophy at the University of St. Andrews. Shortly after finishing at St. Andrews I decided to take the plunge and find out whether or not I enjoyed working in libraries as much as I suspected I might. I accepted the first job I was offered – which happened to be at the University Library, in Cambridge. Consequently, I found myself on a series of trains, accompanied by as many of my worldly possessions as I could carry, travelling pretty much the length of the country, one snowy weekend back in January. Thankfully, the move paid off, and I spent a happy six months at the UL. In my short time at Nuffield I have already been able to build substantially on my previous experience. I’ve very much enjoyed getting to grips with the wide variety of the duties required of the trainee at Nuffield (from leading tours of the library to ordering and processing a constant stream of new books). The skills and knowledge I’ve gained at work so far have been complimented excellently by the training provided on the graduate scheme itself – which often offers the opportunity to explore aspects of my day-to-day work in greater detail (and in a risk-free environment!). The year has only just begun, however, and I for one am greatly look forward to seeing what challenges still await us! Humble greetings from the SSL! My name is Luke, and along with Anja I am one of the two trainees working at the Bodleian Social Science Library. I’ve been meaning to write a post on the blog for a while now, but life at the SSL is anything but quiet! To get things going I’ll follow the example of my fellow Trainees, and tell you a little about me. This year I graduate from the University of Gloucestershire with a 1:1 in Religion, Philosophy and Ethics (unlike some fancier Universities my ceremony isn’t until November!) and during my time at University I had several jobs. After deciding retail wasn’t for me, I made what I now realise to be quite an important decision. Having worked as a Student Temp for my campus Library, I was lucky enough to be promoted to the position of Library Advisor at Francis Close Hall. It was hard work at times but lots of fun; I really enjoyed working with a fantastic team of people, and I think that perhaps that was what inspired me to participate in this year’s Graduate Trainee Scheme. That and one of my colleagues at the time sent me a timely link to the advert on the Bodleian website! As I don’t live in Oxford I’ve found the biggest challenge so far has been getting to work. Buses aren’t my favourite thing, and it’s a bit expensive to drive all the time, but I think I’m getting the hang of my routine now. It’s been really fun meeting all of the Trainees, and I’m lucky to be able to work with Anja who (just about) manages to keep me on track most of the time. In terms of the role itself, being a Graduate Trainee at the SSL really is an experience. Despite the title, Anja and I are responsible for a number of things. A truncated list would include managing the generic e-mail account, booking group study rooms, creating and managing invoices and overdue notices, looking after the processes surrounding missing, lost, and ‘claimed returned’ books, handling the post, and lots of other more usual Trainee things like shelving and sitting at the issue desk. Though it initially seemed like a lot of work, I think it’s fair to say that Anja and I are really enjoying ourselves. Because our role straddles the worlds of Reader Services (anything to do with helping readers – front of house stuff) and Technical Services (anything to do with managing the resources that the Library has – behind the scenes stuff), we’re getting a fantastic insight into the workings of a University Library, which even with a fair amount of experience I was still largely in the dark about in some cases. 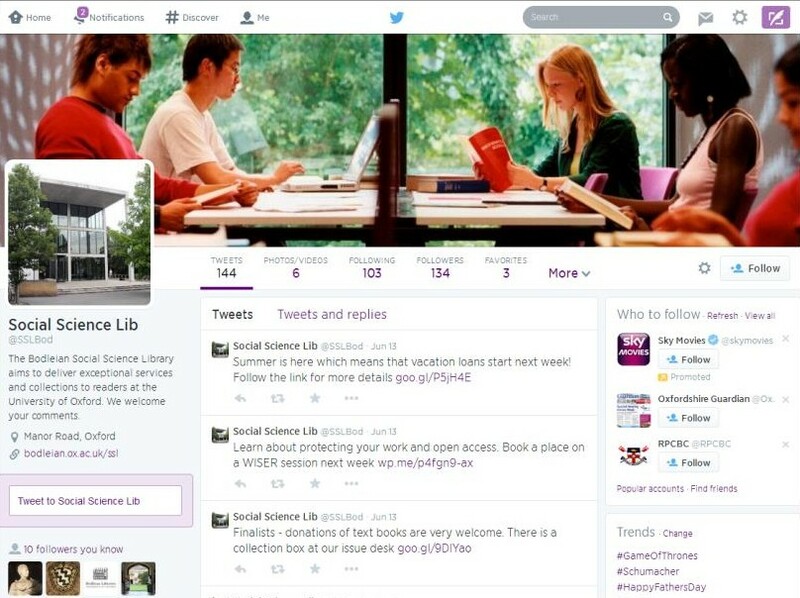 There have even been some opportunities to make original contributions to the Library – we’ve recently finished setting up the SSL twitter account at https://twitter.com/SSLBod! The regular training supplied by the Graduate Trainee scheme has been incredibly helpful so far, and in conjunction with some of the courses offered by IT services at the University it is set to be more and more useful and informative. Everyone involved with the scheme (and especially everyone at the SSL) is really friendly, and I’m so glad I got to be a 2013/14 Graduate Trainee! Hopefully I’ll be able to give you guys an update later in the year. Until then, ciao! Hi, I’m Lucy and I’m the trainee at the Sackler (Classics) Library this year. I graduated in 2012 with a BA in Classical Archaeology and Ancient History from Oxford. I’ve spent the last 12 months working at a children’s bookshop in Cambridge and volunteering in a couple of Cambridge University Libraries to gain more experience of library work. Although volunteering in a Psychology Library and an Agricultural Archive was really interesting, it feels nice to be returning to my subject area and a little odd to be returning to the library where I spent a great deal of my undergrad studying! The Sackler library was opened in 2001 and houses the collections belonging to the old Ashmolean Museum. The building was designed with its classical subject areas in mind and the circular layout of the building is quite unusual too. This, along with a number of different classification systems taken from the old libraries, can sometimes make navigating the library quite confusing! The trainee scheme has been quite busy so far. It’s been great getting to know all the likeminded trainees who enjoy all things library related and to be getting to grips with library work. In the month since starting at the Sackler, I’ve mainly been based on the issue desk and in the technical services room, processing new books, all whilst trying not to look too lost when wandering round the identical circular floors! As well as the work, there’s also been plenty of time for tea, cake and bumping into unsuspecting former tutors, who seem quite startled to see me back again behind the issue desk! I’m looking forward to the rest of the year and excited to make use of all the opportunities the trainee graduate scheme has to offer. Hello Everyone. I’m Eóin, the trainee at the Radcliffe Science Library. I graduated from UCL in 2010 with a degree in Theoretical Physics. Since then I have worked in a bookshop and completed an internship at a publishing house. So far I have mainly been on the issue desk, learning and performing the basics of circulation as well as helping readers out with any printing or scanning issues but I’m also looking forward to spending some time with the subject librarians and collections team in the coming weeks. When term starts I will be spending a day a week at two smaller libraries, the Sherardian Library of Plant Taxonomy and the Alexander Library of Ornithology. I’ll also have a short stint at the Health Care Libraries around Christmas. Welcome to the Oxford Trainees blog! This blog is independent of Oxford Libraries and it exists for the trainees to speak about what they are doing and learning about. We hope you enjoy following their journey. This blog provides hypertext links to external sites. However, it is not responsible for the contents of any linked site, or any changes or updates to such sites.